It seems like us food bloggers are ever on a chase for the best natural light in our homes. And as the days grow shorter and the dark comes sooner each evening, it becomes more and more of a challenge to find the perfect lighting for shooting food. Sure, there are special light lamps and reflectors and light boxes and all that to help recreate the effects of natural light, but I have a preference for shooting my recipes in 100% natural, flattering light. But not all natural light is created equal. Have too much direct natural light and your photos look all washed out. Wait too late in the afternoon and weird shadows start falling. Try it on a cloudy day and your photos can look dark and have a bluish tint to them. For me, I am finding the best place for me to shoot my recipes is beside a window with good indirect sunlight streaming through. Where am I finding the best lighting presently? My son's bedroom, of all places. This is where I shot these photos for my recipe makeover of my very popular Slow Cooker Beef Stroganoff. Beside one of his bedroom windows on a wooden television dinner stand between the end of his bed and his papasan chair. Good natural light is a food blogger's best friend. Dump everything BUT the cream cheese and egg noodles into the Crock Pot. You do not even have to brown the stew meat. When you are close to serving dinner, prepare about a half bag of noodles according to the package directions. Mix in the cream cheese about 20 minutes before serving. Plate up the noodles and top with the beef stroganoff. The "secret" ingredient in this dish is not so much a secret. Maybe more of a swap? 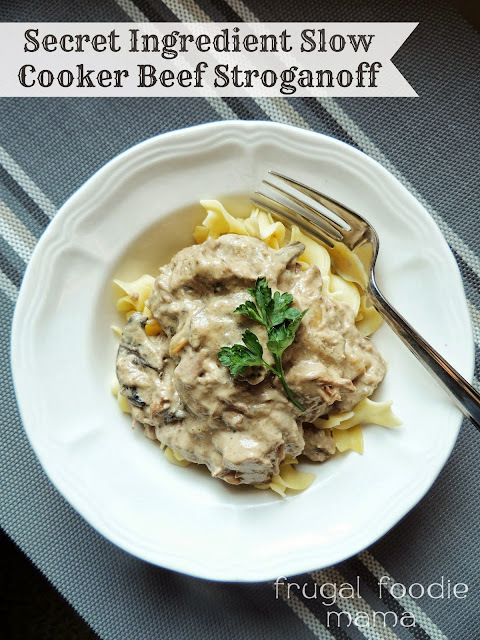 Traditional beef stroganoff uses sour cream in the recipe & mine uses cream cheese instead. This is probably one of my husband's favorite dinners that I make, which is ironic because he loathes mushrooms.